It's back to reality on this Monday following the Christmas holiday. Today it's extremely cold outside, but I'm not quite ready to break into all my pants just yet. 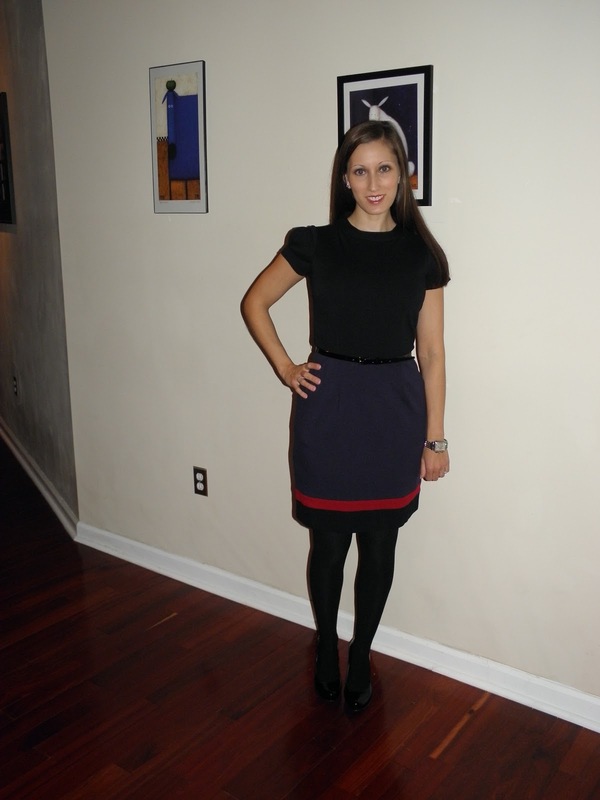 This Laundry by Shelli Segal belted color block dress is fairly warm, and my black tights keep my legs covered, so I thought it would do for a cold day. I love this dress for it's simplicity - and simple details: the puff sleeves, the black patent belt, and the pockets. You also get a good view of my new watch in this picture. I am just loving having such a beautiful piece of jewelry I can wear everyday. The shoes today are my Lady Gaga shoes - the Oh Deer... black patent shoes with the gold heels. They are comfortable and go great with just about anything.